BrainyQuote is available on all iOS devices, including Apple Watch! Create and share more than 500,000 unique quote pictures and wallpapers with our beautiful gallery of high-resolution photographs. Email, text and share your creations with friends, family and social networks. 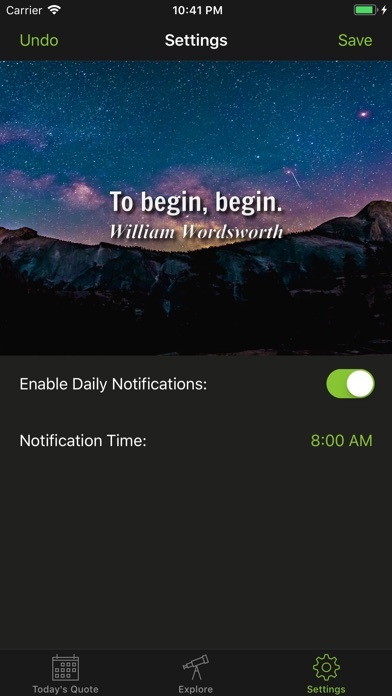 Get Today's Quote - our inspiring quote of the day - in Notifications. You can share it, or save the image to create a stunning wallpaper for your iPhone or iPad. 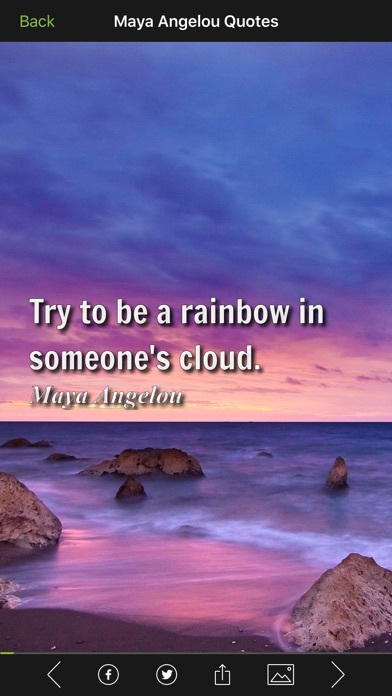 Quotes are educational, inspiring, and great for sharing! 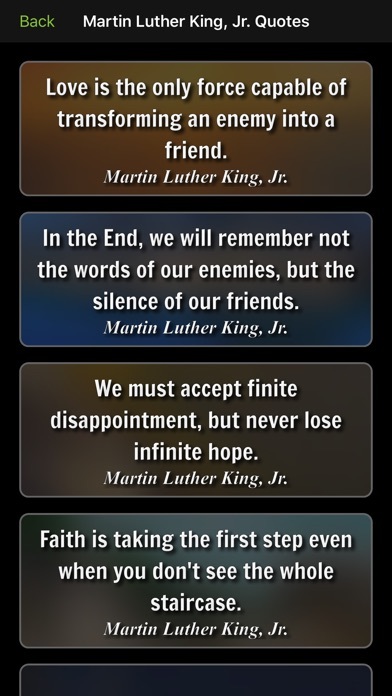 Get Today's Quote - our inspiring quote of the day - right from your iPhone or iPad Notifications screen. Use Settings to choose the time you prefer to receive the quote of the day and enjoy sharing our amazing picture quotes. 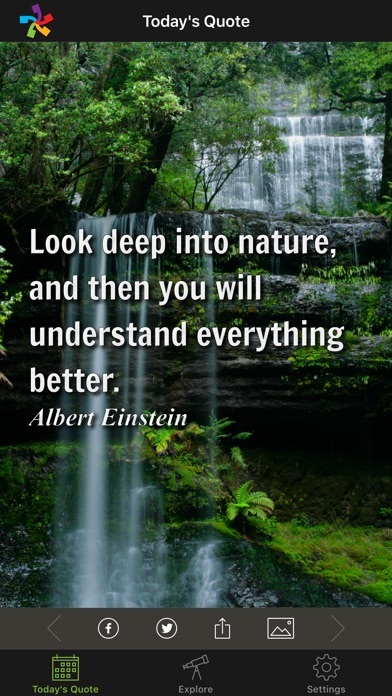 Create and share inspiring picture quotes with our vibrant, awe-inspiring photographs that celebrate natural beauty, and feature stunning scenes of trees, waterfalls, canyons, deserts, icebergs, mountain lakes, lily ponds and more. Place quotes where you want them on the picture of your choice to create customized picture quotes to share with family, friends and social networks. BrainyQuote's App features our most prized and popular quotations, topics and authors. Authors include famous people from the past and present, such as Albert Einstein, Walt Disney, Abraham Lincoln, Winston Churchill, John F. Kennedy and Steve Jobs . Browse or search over 1,000 authors quickly to find the perfect quotation. Choose from over 90 great topics to enjoy Inspirational quotes, Love quotes, Friendship quotes, Life quotes, Funny quotes, Motivational quotes, Success quotes and more. Browse or search over 90 great topics to find the perfect quotation. 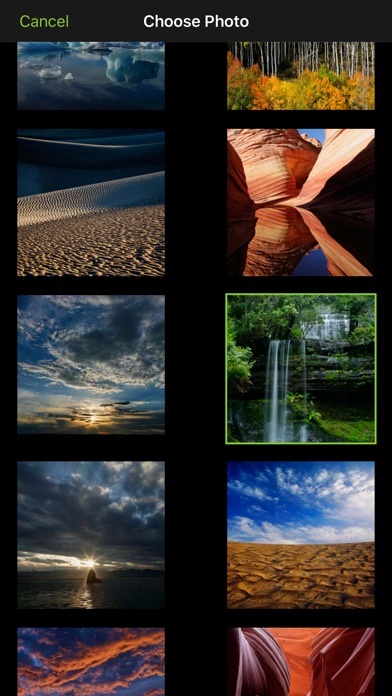 Make stunning wallpaper for your Lock screen and Home screen. Save a beautiful picture quote to your Photos, go to iPhone Settings, select Wallpaper and choose the image you have created. On Apple Watch, enjoy our Quote of the Day and carry an amazing quote collection, on your wrist! Glance at Today's Quote, or tap on Today to view Today's Quote at your preferred time of day. Tap Inspire, Love and Laugh to scroll through our quote collections, and tap Surprise for random quotes. Force press to navigate backwards or return to the start to view our stunning high-resolution picture quotes all over again. We're always interested in hearing from you! BrainyQuote® provides an all-access pass to the world of quotations. Our quotations database is the largest on the web, and getting bigger every day. Join the conversation and share our Quote of the Day with friends, family, and over 3 million BrainyQuote fans.